Exeter Analytical is able to provide fast and effective analysis of metals across various industries using ICP-OES. Our UKAS accredited laboratory holds digestion facilities enabling us to tackle even the most difficult of samples. With a dual-view ICP-OES spectrometer we are able to provide accurate analysis across a range of concentrations, whether it is trace or high level. Inductively Coupled Plasma – Optical Emission Spectroscopy also known as ICP-OES is an analytical technique which enables quantification of elements. Once the sample is introduced into the plasma, a process of ionisation occurs, followed by excitation. The resulting emission, specific to each element, can then be quantified using the intensity to allow detection of trace elements. At Exeter Analytical we pride ourselves on understanding the customer. 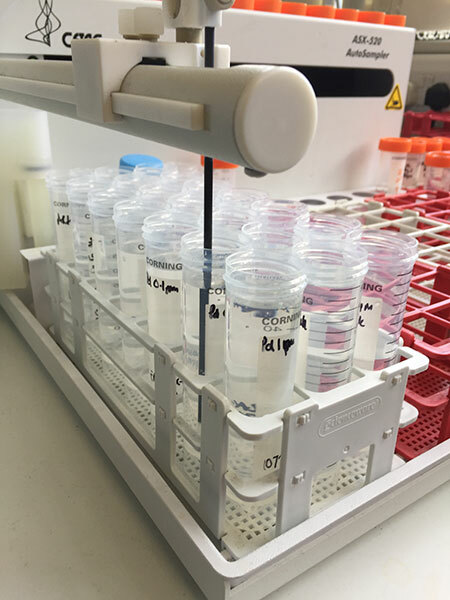 We understand that not every sample is the same and therefore, each sample must be treated in a unique manner in order to obtain the most accurate results. Not only this, analysis requirements vary from industry to industry which is why we offer such a range of ICP-OES analysis. Our laboratory holds facilities to digest materials not only in Nitric but also HF allowing us to tackle complex samples. We also recognise that it is sometimes difficult to know what elements you are looking for and therefore we offer a wide range of single or multi element analysis including a cost effective Quantitative Full Scan of up to 69 elements. Our specialised team are then able to routinely run analysis at multiple wavelengths to identify any potential interference that could affect data quality.